Celebrate a special occasion with true style by sending a bottle of the world's premier Champagne, Dom Perignon. This distinguished gift includes a signature Dom Perignon gift box to make a lasting impression. Inside the recipient will discover a bottle of the celebrated bubbly. Please see the Tasting Notes Tab for more information. Measures approximately 16" x 6" x 6". 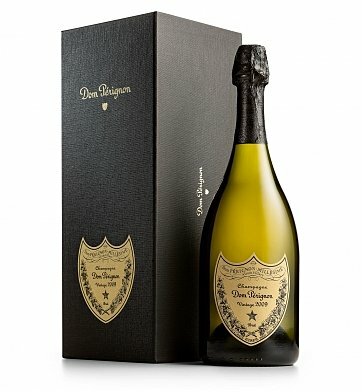 Dom Perignon Champagne in Signature Gift Box is a hand delivered gift. These gifts are delivered by one of our local design centers located throughout the United States and Canada. Same day delivery is available for most gifts when ordered before the cutoff time. The cutoff time for Dom Perignon Champagne in Signature Gift Box is 2 PM in the recipient's time zone. Notes of almond, pear, and hints of cocoa. A signature black Dom Perignon gift box. I was scared of online scamming at first !! But hell no !! You are real and efficient. Thank you. I used GiftTree to ship a surprise bottle Dom for a Very Special Occassion. It arrived on the day promised. The recipient was delighted and very complimentary of the presentation and of course the champagne. Gift came at the estimated time and was much appreciated. My review title: I got lucky: sums up my feelings about my experience with GiftTree. The gift I sent was from the uk to a dear friend in Agoura Hills CA. I was worried as I am in the uk that my gift may not make it as requested, but lo and behold it arrived exactly as promised, and the service and interaction was outstanding. i would and will definiely recommend gift tree to all my friends and colleagues. Top job! GiftTree. It was super easy and I got everything I expected. I would highly recommend this service. Needed to send Champagne out of state. I needed to send a congratulatory bottle of Champagne and couldn't in the past. I googled my need and your ad came up and I gave you a try. Extremely pleased that the bottle arrived on time with no problems! If the need arises again I will use you your services. The Dom Perignon and its presentation box never fails to delight the special recipients. GiftTree takes great care in making certain that all gifts are delivered on time. My sister and her spouse absolutely loved the Dom Perignon that they received for their wedding gift. The box was beautiful, complete with a description in several languages. We are very pleased with our purchase! My husband and I purchased this for our son's college graduation. The presentation was beautiful, and the champagne was excellent!! Great special gift idea to celebrate. Also came right when requested. I looked online at other wine companies, and Gift Tree offered the best option price vs. shipping costs. Item arrived exactly as required. Great service. 50 Years Deserves The Very Best! We ordered the Dom Perignon Champagne in Signature Gift Box and the Engraved Toasting Flutes for our friend's 50th Wedding Anniversary. We then made them into a beautiful basket using the card provided by Gift Tree. Our friends were overwhelmed and we felt good about or choice. I was a little late in ordering the gift because I wasn't sure exactly what to order but Gift Tree had such a wide variety of gifts it was a pleasure to shop and the ideas were great. Both orders were 'free shipping' but I received them the second day during the Christmas season. Amazing. We are sold on Gift Tree and their presentations and we will be taking advantage of their expertise in gift ideas in the future. This was recieved at our home today as an anniversary present for my husband from me. He was very impressed. He does not get impressed/excited by much, but this did the trick. The box is lovely and will be displayed in a curio. The only complaint is that I specifically asked it be delivered on our anniversary (in two days) and was not told that FedEX does not deliver on Monday. So, he recieved it early and will have to wait to enjoy. Also, I was not able to surprise him. Otherwise, great! My second purchase thru GiftTree and I will be back.